VANCOUVER, British Columbia (AP) - The first day of the Winter Games didn't turn out as everyone hoped, or as anyone planned. A wicked crash claimed a life before competition could even begin. Hundreds of protesters forced a detour in the torch relay. And the moment Canada spent seven years building toward - the lighting of the Olympic cauldron - was tarnished by a technical glitch. With hours to go before the opening ceremony, a luger from the nation of Georgia was killed after he lost control of his sled on the infamously fast track at Whistler and crashed into a steel pole. The death of Nodar Kumaritashvili hung over the usually festive first day of the games. Inside BC Place Stadium, the ceremony was punctuated by somber pauses, sorrowful speeches and flags lowered to half-staff. The 21-year-old slider's grief-stricken teammates marched with black armbands and scarves. Then, at the climax of the three-hour show, with four torch-bearing Canadian sports heroes in the spotlight, a technical error ruined the symmetry. One of four pillars designed to rise from the stadium floor and form the Olympic cauldron malfunctioned, leaving speedskater Catriona LeMay Doan unable to join in the lighting. Hockey great Wayne Gretzky, skier Nancy Greene and basketball All-Star Steve Nash proceeded as planned; LeMay Doan saluted the crowd with her torch. Things went off-course outside the stadium, too. Hundreds of anti-Olympic protesters forced organizers to change the route of the last leg of the trans-Canada torch relay, then confronted police - and threw debris - outside the stadium hosting the opening ceremony. And as a backdrop to all this, relentlessly bad weather continued to beset the two Olympic skiing venues, forcing cancellations of training runs and the delay of the first two Alpine events - the men's downhill on Saturday and the women's super-combined Sunday. If the games were seen in part as a means of luring vacationing skiers in the future, the reports so far of rain and mud haven't helped. It was a rough day in particular for John Furlong, the earnest CEO of the Vancouver Organizing Committee, who started working to bring the games here years before the bid was approved by the International Olympic Committee in 2003. He and his team had strived to be ready for every contingency, but Friday did not go as planned. "I am so sorry to be in this position and to be reporting this to you," Furlong told reporters as he confirmed Kumaritashvili's death. "It's not something I had prepared for, never thought I would need to be prepared for." Later, at the opening ceremony, he urged the athletes to compete in the Georgian luger's honor. "May you carry his Olympic dream on your shoulders and compete with his spirit in your heart," Furlong said. The sorrow contrasted starkly with the jubilation of the Canadian team- and their thousands of red-and-white clad fans - as they exultantly entered the stadium. This is the third Olympics held in Canada, but the previous home teams won no gold medals in 1976 and 1988 - while this talented, 206-athlete squad has proclaimed its intention to win the overall medal race. Gold medals for Canada, especially in the next few days, would likely ease any Olympic misgivings for much of the country. The opening ceremonies were dedicated to Kumaritashvili, and the seven remaining members of the Georgian team, who decided to stay and compete, wore black armbands as they marched behind a black-trimmed flag. Most of the crowd rose to give respectful applause. Rain fell lightly during the evening and was forecast through the weekend, with high temperatures near 50 degrees, prompting some to dub these the Spring Olympics. About 2,500 athletes from a record 82 countries are participating in the games, vying for medals in 86 events - including the newly added ski-cross competition. 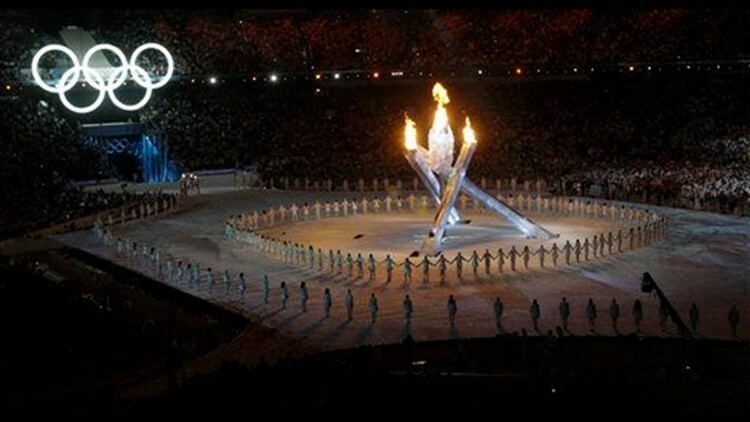 First-time Winter Olympic participants include the Cayman Islands, Columbia, Ghana, Montenegro, Pakistan, Peru and Serbia. The overall favorites include Germany and the United States - which finished first and second four years ago in Turin - and also Canada, a best-ever third in 2006. The cultural segment of ceremony featured many of Canada's best-known musical stars - including Bryan Adams, Nelly Furtado, Sarah McLachlan and k.d. lang. It also highlighted performers and traditions from Canada's aboriginal communities. And the highest-ranking official delegation at the ceremony - amid dignitaries from around the world - included the four chiefs of the First Nations whose traditional native territory overlaps the Olympic region. Activists espousinga variety of causes prompted the relay to change course twice as it passed near Vancouver's skid-row neighborhood, the Downtown Eastside. Later, several thousand protesters marched to the stadium, where hundreds of police were waiting for them. A standoff lasted more than two hours - with some sticks and water bottles thrown toward the officers. Furlong sought to strike a positive note, though, in his speech at the ceremony. "We invite people everywhere to share and experience, even if just for a few moments, what it feels like to be a proud Canadian," he said.